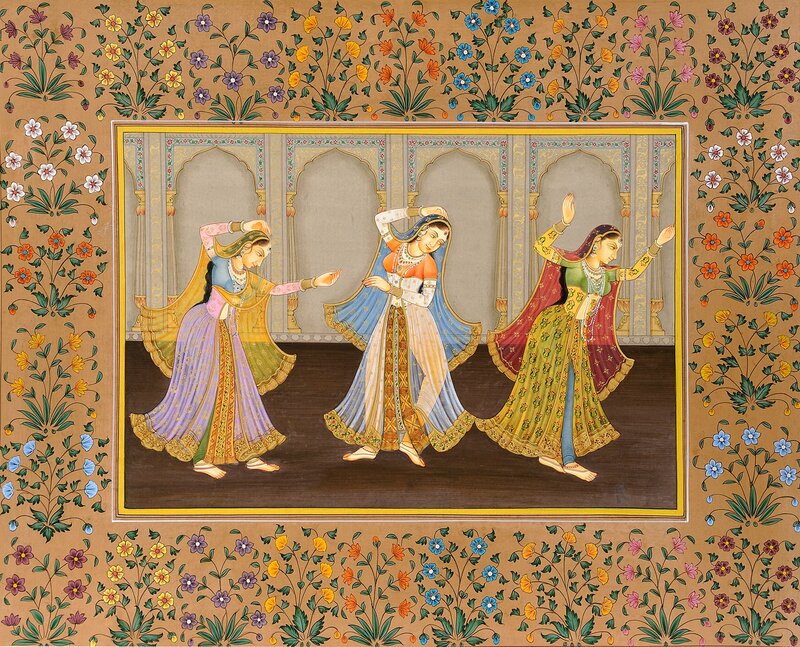 The painting, a fine miniature rendered in characteristic Mughal style as prevailed around 1640-50 during the period of the Mughal Emperor Shahjahan, represents three ladies, obviously the court-related, performing dance in a pavilion. Except on special occasions like marriage in Mughal culture ladies were rarely represented dancing, and with no festivity around the painting is not indicative of any such occasion; however, its Mughal character reflects in the entire painting. The ladies’ iconographic features – sharp noses, large eyes, delicate lips and slender figures, the style of costumes, body gestures, diffusion of colours and their light tones, all link them with Mughal court-life and style. As regards the movement of feet, gesture of hands and the facial demeanour, all three ladies have been portrayed in different body-postures. They all are wearing costumes with identical fashions and made of alike transparent textiles, in its colour scheme each figure’s costume is different from the other. The cult of transparent garments is a European influence which had reached India from European paintings during the period of Jahangir itself. Worked with gold zari and printed with fine elegant butis and flower-motifs their costumes, when they float in air with the movements of their bodies, appear far more beautiful. The ecstasy that reveals in the pace of their feet and movement of their hands suggests that their absorption in dance is absolute. Profusion of red, green and purple and abundance of gold used for defining the borders of lehangas and other parts and the ornaments are essentially the elements of Shahjahan’s period known for its magnificence and splendour. The wall on the back has been divided by fine shallow arch-motifs with delicate lines in gold defining their contours and floral bands surmounting them. These are the characteristic elements of Mughal architecture of the Shahjahan’s period. Lest it overshadowed the beauty of the arches, the floor has been designed as plain. The painting has been framed in double border. On the inside is a three-lines sleek border which is contained in a broader one painted with flower and leaf motifs, again a characteristic feature of Mughal art as it came to prevail and ever sustain after the period of Jahangir who especially favoured lavish broad borders sometimes occupying more space than occupied the main painting. This description by Miss Farha, who holds a Phd in Mughal Painting. (MJ 51) Portrait of a Blind Lyrist A brilliant piece of art in miniature format, this excellent portrait, rendered realistically and endowed with merit to equal any great portrait the modern school of art, represents a blind lyrist playing on his Ekatara – a single-stringed lyre. The portrait is denotative of the cult of the late nineteenth century Indian art when influenced by European Renaissance the Indian painters were looking at common man for his art-theme. The medieval miniaturist could hardly think of painting a blind man, the object of social indifference or even aversion. The artist has sought to distinguish the figure of his blind lyrist from the imaginary portraits of Suradasa, the great Hindi poet of the fifteenth century, represented in the like manner playing on a lyre by adding a beard which is not the part of the portrait of the poet Suradasa. This keeps his subject in the realm of common man and makes his approach realistic, not imaginary. The artist has further distinguished him from the person, who with his closed eyes gives the impression of being absorbed in his melody. The deeply socketed eyelids, obviously indicating that there are no eyeballs within, emphasise his subject’s blind man’s identity. The known early seventeenth century English poet Milton was blind. In his sonnet ‘On His Blindness’ he complains to God why He gave him the gift to compose verses and sing if he was to be deprived of his ability to see. The voice from within replied that the eyes had only descended within to let the world appear more beautiful and glowing. Milton was contented for the life. The contentment on the face of the blind lyrist, which reflects in flowing lines on his forehead, in contraction of eyelids and in the overall demeanour of his face, is Milton-like, and perhaps as deep rooted is his faith in God Who deprived him of one gift but gave him two, the eyes within and the melody beyond and submerged into it he sees only the glory of God pervading the entire world. His contentment is absolute and he has just prayers for everyone’s wellbeing. To add to his personality such asceticism the artist has portrayed him with a saint’s like beard and in an ascetic’s like saffron gown. As suggests his mixed beard, wrinkles on face, shaded cheeks, deep subdued areas around eyes, coarse skin, fingers’ form and casually dressed hair the blind man is in his advanced years. Keen to focus only on his theme : the lyrist’s absorption in his melody and divine contentment on his face, the artist, as would do a realistic portraitist, has evaded including the full forms of both, the instrument and the instrumentalist, lest the unnecessary details of them dragged the viewing eye away from the ‘essential’ to subsidiary details of little significance. With effective strokes of his brush he has drawn with perfect precision and great distinction each wrinkle, each hair, each fold of his chogha and each shade of his mind reflecting on his face.